Do you know what happens when you clean and organize a room or an area in your home...you find out that you have bought multiples of something! I just found out I have 3 rolls of freezer paper and 2 rolls of Heat and Bond. If I had them out where I could see them, I would have saved some money. Here's my solution for where to store rolls of crafting paper where I can see it, but still out of the way. The other legs has all my ribbon. Click HERE to see that post. I had these 2 drawers left over from our kitchen remodel, so I just stored them in the leg area of my table to get them out of the way, knowing I would find something to do with them. Ahh...tension rod space!! They fit perfectly. I just stacked them on top of each other. This idea would work great for you if the legs of your table aren't wide enough to support the tension rods. You can use old drawers, wooden boxes or even a small shelving unit that might fit between the legs. Tension rods are about $1.50-$3.00, depending on the size you need. Just slip the rod through the rolls and adjust the rod to fit. Now for the next tip to label your rolls so you can tell what's what. I searched around my sewing room to see what I had that would work with paper. I found my absolute favorite binder clips and the little plastic cards that hold embroidery floss. Click HERE for my other binder clip ideas. Squeeze one of the metal handles. It slides right out of the slot. Insert the handle into the ring of the embroidery card. Squeeze the handle back into the binder clip. Now you're ready to label anything that you can attach the clip to. Just clips on to the edge of the roll of paper. I store freezer paper for English Paper Piecing, Heat and Bond to attach fabric to another fabric and I also have tracing paper for crafting. Click HERE and HERE for the 2 tutorials I have for English Paper Piecing with Freezer paper. This is an old picture of how I stored ribbon in the past...tension rods inside a bookshelf. You could also use this idea to store your rolls of paper. Here's another idea for storing rolls of different papers. This is an old picture of my cutting table. 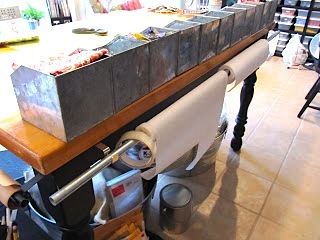 I screwed curtain rod brackets under the lip of my table and then used an electrical conduit pipe to hold the rolls of freezer paper and Heat and Bond. Electrical conduit pipe is super cheap and comes in long pieces that can be cut to size. A piece of pipe that is 1/2 inch wide by 10 feet long ( yes, 10 feet) is only $2.24...crazy cheap!! This is perfect for gift wrapping paper too!! I hope you can use a few of the tips I shared today to organize your space. This is brilliant and has just given me an idea for an old shoe cupboard. It's a bit grotty so I'll have to see if it can be salvaged. Thanks for the inspiration. Love how you labeled everything too. You're amazing. I am amazed at the many uses for 'binder clips'. I wish I would have saved our drawers from our kitchen remodel ! Great idea! I already have my ribbon hanging in a similar fashion, so now I just need to hang my paper. Now, why didn't I think,of that? Very clever using the binder clips! Another great organizational idea! I don't know if you have ever bought any of the cloth sheets that you use to print pictures on your computer but they are very expensive. Six sheets for around 20.00. I make my own using freezer paper and muslin fabric. I use a sheet of card stock as a pattern. Use a dry iron to get the wrinkles out of the muslin lay the freezer paper on top of the muslin shiny side down and iron with a hot iron until the fabric is attached. Just put the paper in your printer paper side up and print your pictures. Just pull the paper off and your picture is ready to attach to your crafting project. I love your blog so much. You always have wonderful ideas. When my craft studio grows up, I want it to be just like yours. I keep a tray of different size binder clips in my drawer. They are so useful. Right now I am using some of your ideas to get better organized. I have been planning to build something out of pcv pipe to stand at the end of my cutting table and hold tracing paper. You have inspired me to make it large enough to hold several rolls of paper and possibly rolled up interfacing and elastic too. It would even be good to include bars to hold ribbons and gift wrap, because the counter level cutting table doubles as the best place to gift wrap too. Thanks for the inspiration and your label tags are brilliant. I love the labeling idea!!! Will have to remember that on! You never cease to amaze me with your genius ideas that I can never think of on my own. LOL! Can you PLEASE come to my house and do some really cool organizational stuff? What neat ideas. I'm gonna have to look around and see how I might incorporate that idea into my spaces. If you are interested, you can also make a trimmer attached to the table top to trim all but the plastic very quickly. Just use a 20" hacksaw blade as your cutting blade. Attach so you can feed the paper underneath it, then just pull up against the blade to cut. You would still have to use scissors for vinyl or contact paper, but it makes it much easier to cut the other papers on your tension rods.